Artistic passion may sometimes seem like a secondary consideration today, especially when faced with a society that rarely rewards originality. But while Rufus Reid’s talents as a bassist – and composer – have continued to win him critical acclaim, he still professes a youthful idealism about jazz, his own future and the importance of creativity. He wants his voice and his music to be heard – whether by jazz audiences or by students – but he’s also humble enough to know he’s only as effective as his message. When I catch up with him one afternoon at Local 802, he is characteristically soft-spoken at first. But as our conversation continues, he becomes by turns animated, reflective, witty, self-effacing and emphatic. Throughout, he remains forthright in his opinions, and down-to-earth when addressing his own strengths, and what he perceives to be his limitations. Feb. 10, 1944, to Sylvia Lindsay and Alvin Andrew Reid, who were both teachers. Atlanta, Reid recalls, was terribly segregated at the time. His parents ran their own school, called Reid’s Business College. One reason for its success was that it offered black students the chance to study typing and stenography, a resource otherwise unavailable to them. His father was soon to leave the family, and Sylvia ended up supporting the four Reid children on her own. When he was still a boy, Reid’s mother moved them to Sacramento, where she enrolled Rufus in the local school system. He took up the trumpet. During this period, Reid found himself in the center of the then-exploding R&B and southern soul scene. He witnessed scores of performances by artists like James Brown, Ike and Tina Turner, and the original Motown Revue, to name a few. Reid remained in the service for five and a half years. In early 1966, when he came back to Sacramento, he sold his trumpet, bought a bass, and soon got the chance to play with Wes Montgomery’s youngest brother, pianist/vibraphonist Buddy Montgomery. Reid recalls this as another highly significant moment. After a stint in Seattle and lessons with the principal bassist of the Seattle Symphony, Reid was accepted at Northwestern University, and moved to Chicago. While in Chicago, the now 25-year-old Reid studied with Warren Benfield and Joseph Guastefeste. He sought to realize his burgeoning vision of himself as a “complete musician,” and began working with a variety of pickup bands and pit orchestras, including many jazz gigs and the occasional symphonic date. 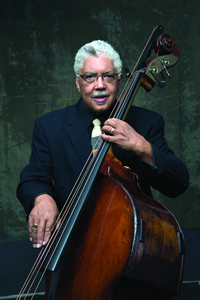 By the mid-1970s, Rufus Reid had become one of the most sought-after jazz bassists in the United States, appearing with a wide range of acts, including Eddie Harris, Nancy Wilson, Harold Land and Bobby Hutcherson, Lee Konitz, Thad Jones & Mel Lewis, Dexter Gordon, J.J. Johnson, Art Farmer, Stan Getz, Kenny Burrell, Kenny Barron and countless others. His 1974 book, “The Evolving Bassist,” is still considered an industry standard. Reid’s transition from full-time performer to leading jazz educator came naturally. By 1979 he was ensconced at William Paterson University, where he developed a highly regarded program that continues to attract top flight students. Throughout his tenure there, Reid encouraged a progressive approach, but maintained his discerning eye when dealing with pedagogical matters. Reid’s evolution from performer to composer happened gradually. After 20 years at William Paterson, he recognized that he had grown comfortable, and perhaps somewhat complacent. In 1999, he joined the BMI Composers Workshop, and began working with such legendary composers as Jim McNeely, Michael Abene and Manny Albam. Overall, Reid’s efforts were lauded by his colleagues, and he began to seek other ways to develop his craft. Fellowships and grants followed (he won the Beverly Sackler Prize in Composition in 2006 and a Guggenheim in 2008), and he suddenly found himself in the estimable position of having his work performed in public. Throughout his career, Reid has maintained a reverence for his roots and a sense of wonder at the gifts he’s been given. Back in the early 1970s, when he was living in Chicago, he reconnected with his father, whom he had not seen in decades. Reid understands the importance of passing on his legacy through teaching and writing. For him, as for many artists, this is part and parcel of recognizing the deeper meaning behind jazz and its significance in the American cultural landscape. He also recognizes the importance of maintaining high professional standards, and upholding one’s integrity as a worker in a society where words like “monetization” and “downsizing” have become increasingly prevalent – and where the study and appreciation of live music has diminished. Reid acknowledges Local 802’s efforts to make things better for musicians. And he is a supporter of the union’s Justice for Jazz Artists campaign. Reid continues to perform, teach, lecture, record and compose. For many years, he co-led the group TanaReid with drummer Akira Tana. They produced five critically acclaimed CDs. Over the past decade, a project has come into being, the serendipitous nature of which still amazes him. It’s called “Quiet Pride” and it’s a five-movement suite for large ensemble inspired by the sculptures of African-American artist Elizabeth Catlett. So Reid found a way to get in contact with Catlett’s son, Francisco. And, as it turned out, Catlett herself was living in Mexico but came to New York every April, where she had an apartment. 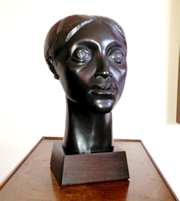 An Elizabeth Catlett sculpture called “Glory” (1981). Finally, a meeting was arranged, and Catlett came to hear Reid play. “She was, I think, 93, and she used a walker,” remembers Reid. “But she made it. It was an incredible night.” A few years later, in 2012, Elizabeth Catlett died at the age of 96. Perhaps Reid’s most passionate exhortation comes at the end of our interview. I ask him how we may ensure that the music has a secure future, and that more young people become exposed to jazz. Rufus Reid’s new CD “Quiet Pride” will be released on Feb. 10 in honor of the composer’s 70th birthday. It is available at motema.com and RufusReid.com.